Nacatamales are a Nicaraguan comfort food. However, they are also eaten on special occasions, or in my family when someone has a craving. They are served wrapped in a thick green banana leaf. Their insides consist of corn meal dough (masa), which hold your vegetables, rice, and meat of choice. When I became vegetarian three years ago I thought I had to say goodbye to not only one of my favorite dishes in the world, but a piece of my culture. Lucky for me, I happen to have an incredible mother who is not only supportive, but innovative. 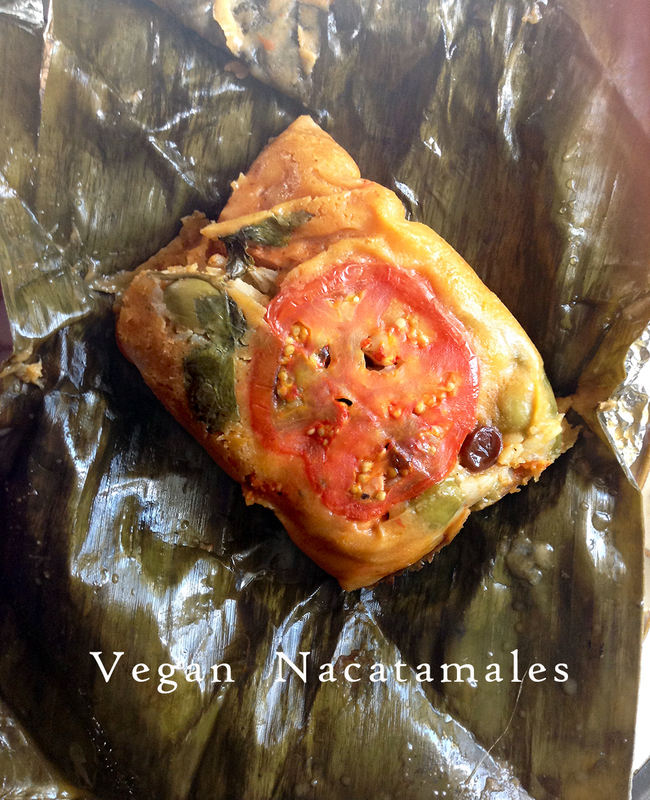 Through a series of trial and error we finally perfected the Nicaraguan Vegan Nacatamale, and they’re a hit among the vegans and omnivores of my family. It’s a lengthy process, but entirely worth it. One of the differences between regular nacatamales and my mother’s vegan nacatamales is that instead of using pork lard for the dough, she uses extra virgin coconut oil and extra virgin olive oil. My meat of choice for the nacatamal was once pork, and I’ve replaced it with jackfruit. 1) First, blend the dry ingredients for the masa together with the orange juice in a blender. 3) Season the Jackfruit with spices and achiote paste. Once evenly seasoned add a a tablespoon of lemon. 4) Lay out the aluminum foil and on top of that add a banana leaf. Add a cup of masa to the center. 5) Begin arranging the filling ingredients. (Don’t overfill or closing will be difficult). 6) Now comes the folding. (It’ll help if you keep in mind the wrapping of a gift for this process.) Fold the long edges of the banana leaf/foil over together. Then fold the small edges over each other. It’s very important you get them as snug as you can with only a little room to breath because the masa gets bigger as it cooks. Then tie together with twine. 7) Next you steam the nacatamales for a period of 3 hours, in roughly 2 or 3 inches of water. Keep checking the water to make sure it doesn’t boil over, or if you need to add more. 8) Once the 3 hours are done. Remove the nacatamales from the pot, cut the twine and unwrap your nacatamal. It will be very hot so be careful. 9) Enjoy with a cup of coffee and some bread if you’d like. Anasylvia is a a recent college graduate from Los Angeles, CA. She has a variety of passions such as gardening, cooking, reading, traveling, and writing. When she’s not hunting for her next delicious meal, she can be found with her nose in a book. She has a blog where she shares her thoughts on everything bookish. Follow her on Twitter and Wordpress. What if you can only find Jackfruit in syrup? Have you ever tried playing with that? Or is it best to go on a hunt for the in brine/water? it’s going to be super sweet if it’s in syrup – if you’re using jackfruit in something savory, look for it in brine or water for sure. I’m in the same boat (I miss nacatamales). I’m going to try your recipe and see how it goes. Thank you for sharing! !